Whenever user often accesses a shared mailbox, we add the shared mailbox as an additional mailbox in each user’s Outlook profile. This works fine, except for the fact that e-mail messages sent from the additional mailbox go into the “Sent items” folder of the primary mailbox within a user’s profile. In order for the other users accessing the shared mailbox to keep track of the activity in the shared mailbox, it’s important for us that outgoing messages are stored in the “Sent items” folder of the shared mailbox. This is a common situation, and not just with Exchange 2010 and Outlook 2010. 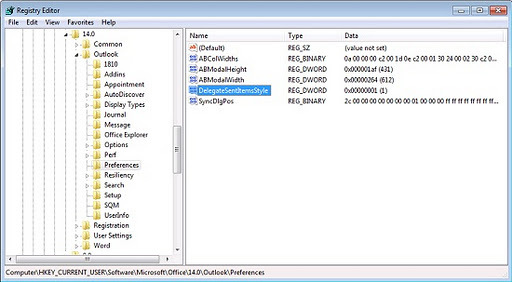 Although it isn’t well known, we can change this standard behavior using an Outlook client-specific registry key. When adding the registry key, when you reply to or forward e-mail messages located in the shared mailbox, they actually go into the expected “Sent items” folder. Note that it needs to be created on HKEY_CURRENT_USER. requires a new registry key.